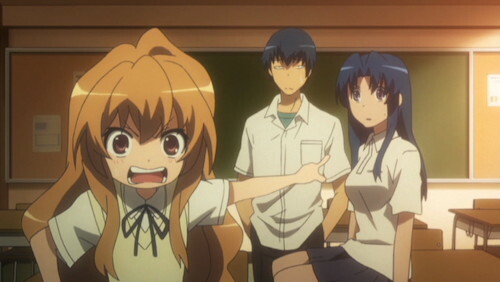 Having finished the first season of Toradora, I’m surprised with the way the series is walking a well-trod path, and pleased at both the choice and execution. Ryuuji is a fiend... for cleaning. The set-up is pretty simple: You’ve got Ryuuji, an entirely domestic boy who happens to look like a scary punk and Taiga, a pint-sized girl with no social skills and a bad attitude who people are rightly afraid of. Ryuuji likes Taiga’s energetic friend, while Taiga likes Ryuuji’s hyper-competent buddy. Toss in Ami, a model who puts up a ditzy front to hide an entirely unpleasant, mean-spirited interior who may or may not like either of the guys, to mix it up. 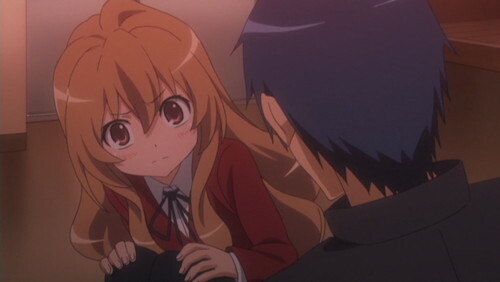 Taiga and Ryuuji team up to help each other chase the ones they’re after. Now, you can see pretty much exactly where this is going from the first episode: Taiga and Ryuuji will, of course, fall for each other, and at the last minute decide that they’ve been chasing after someone else while their true love has been right in front of them the whole time. What happens to the other three is kind of irrelevant, apart from maybe some character building or a last-minute three-way competition for the male’s attention. Instead, the show dodges that entirely; Taiga and Ryuuji both figure out quite quickly that they could get something going between them, and even that it wouldn’t be entirely bad. But neither of them necessarily wants that to happen, and they also have fire for the unobtainable alternate, which they lack in the more practical partnership with each other. So rather than the show being about coming up with increasingly implausible excuses to keep them apart, it comes right out and accepts the underlying pretext, then says up front that maybe it just doesn’t want to go there. Taiga and Ryuuji are sort of opposites when it comes to energy level. Having the characters admit that outright would have been enough to make the series worth watching through for me—I like the straight-faced decision to aim for something else, rather than avoid the truth that’s right in front of them. It establishes the old married couple (or maybe brother-sister) dynamic right off, with both participants wanting a relationship with more passion, less practical. Further, it does a particularly good job with making the alternates appealing. Ryuuji’s friend Yuusaku is kind, cheerful, bespectacled, and unlike your average smart anime guy with glasses, hyper-competent in pretty much everything—he’s even got a hardbody at the pool. No surprise Taiga would get excited about him. Taiga’s girlfriend, Minorin, is something else entirely—she’s such a force of nature she could probably carry the show. In terms of role she’s the “happy, crazy girl,” but unlike most characters in that mold, who are non-functionally crazy and funny because they’re entirely unaware of what’s going on around them (or don’t care), she’s quite aware of what’s up, quite competent at life in general, and entirely wacky. She’s basically paying attention, yet never fails to do something colorful and/or hilarious when necessary. That she also feels like a real person underneath it is a testament to the characterization in the show. 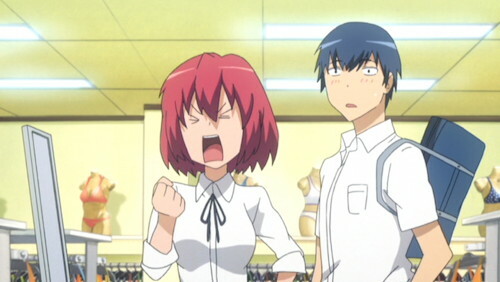 Minorin's mere presence can make pretty much anything funny. So you can see from minute one why Ryuuji would be smitten with her—she’s just plain fun to be around, and when she reveals a little of her heart, it’s clear that she’s also an interesting person inside. All the more so because he’s… well, boring and domestic. Now, by all indications, neither of the two people being chased would be a particularly good match for the ones chasing them. But it isn’t going to stop them from trying, and there’s enough contrast there that the dynamic actually works. That everybody is friends with everybody else also makes for more fun and less pointless drama—they’re mostly hanging out, not hiding from each other. In short, there are only five characters (thus far not even any significant secondary characters), but they’re all fun, colorful, and substantive enough to make the series work. The other thing that the show has, unexpectedly, going for it is emotional substance. The setup is pretty wacky, as are the characters, yet somewhere around half of the time is spent on emotional drama of some level. Bad parenting is the main constant here—Ryuuji’s mom is amusingly nonfunctional (good excuse for him being so good around the house) while his gangster dad got himself killed long ago, Taiga’s absentee dad offers a clear explanation for her bad personality, and there’s a hint that Ami may also have some parentally-induced issues hiding inside (even superficially, the stress of life in the spotlight has obviously done bad things to her). Working around these issues provides worthwhile drama that doesn’t feel out-of-sync with the humor or broad characters. Kyouran Kazoku Nikki is probably the closest emotional match I can think of (and there’s a little of Kyoka in Minorin), but the drama here is much lower-key and the wackyness less insane. I also like very much that, due to the characters having useless or entirely absent parents, they’re left to fend for themselves emotionally. As such, Minorin’s steadfast friendship with Taiga has more substantive meaning, as does Ryuuji—who’s essentially his own (competent) parent—filling in the family vacuum that existed in her empty home. Unexpectedly, there's actually drama, too. This is, coincidentally, an interesting parallel with Persona, which has a cast of mostly-orphaned high schoolers who, similarly, have no one to rely on for emotional support but each other. 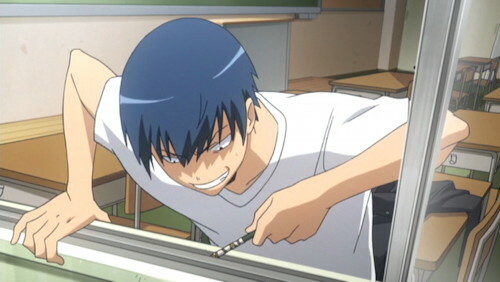 The art in Toradora isn’t much to speak of, but I like the character designs, and the lively character animation makes up in personality what the backgrounds lack. The first of two seasons ends strong, with a pleasantly dramatic finale that reveals enough about what makes the characters tick for me to want to see more, while leaving plenty of room left to have things not get where they will almost certainly end up too quickly. Thoroughly looking forward to seeing where it’s going to go with the remaining half. Final note, because I just can’t say this enough: I don’t care what else is right or wrong with them, NIS’s DVDs of this series rock—a single chunk of minimal, skippable logos at the start gets you watching almost as quickly as if you’d downloaded an illegal copy. Why every company doesn’t do this is a mystery to me, but I hope they learn.